Ashleigh Trapuzzano will present research Saturday at the Academy of Geriatric Physical Therapy conference. Ashleigh Trapuzzano devotes herself to research to benefit elderly adults and her work has not gone unnoticed. 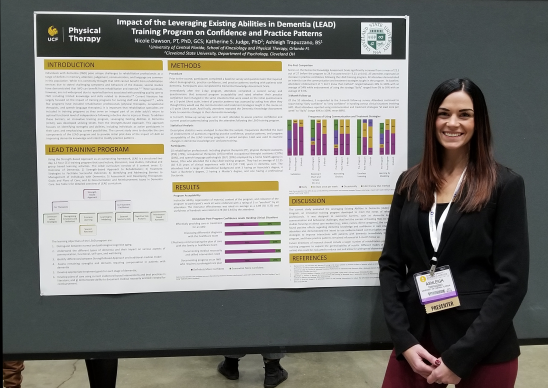 The Academy of Geriatric Physical Therapy on Thursday presented Trapuzzano, a third-year physical therapy doctoral student, with the 2019 Student Award for Research at the academy’s national convention in Washington. The award recognizes outstanding research by entry-level physical therapy students. Trapuzzano will also receive a $100 prize. Assistant Professor Nicole Dawson, with whom Trapuzzano worked as a graduate research assistant in the Innovative Mobility Initiative Lab, wrote a recommendation letter on her behalf. “Trapuzzano impresses me with her exceptional achievements inside and outside the classroom through academic excellence, commitment to research and dedication to leadership,” Dawson said in her letter. Trapuzzano served as the principal student investigator on her capstone project, “What Makes Us Walk: Predictors of Gait Speed in Community Dwelling Older Adults.” She and her team found that lower extremity strength, balance and executive function were unique predictors of comfortable gait speed. Meanwhile, lower extremity strength, balance and processing speed were indicators of fast gait speed. Trapuzzano will present her research Saturday at the conference. She also serves as the co-investigator on an ongoing funded grant project entitled “Investigating the Unique Predictors of Comfortable and Fast Gait Speed in Community Dwelling Older Adults” and serving as the project manager for a funded trial in the IMOVE lab. Trapuzzano previously presented four national peer-reviewed presentations during the past two years and published one professional article, with two more currently under review. “Through these avenues, Ms. Trapuzzano has demonstrated outstanding research skills and dedication to broadening the body of knowledge benefitting older adults,” Dawson said. Trapuzzano will graduate this spring and credits her experience, success and recognition to the faculty in the physical therapy program at UCF.